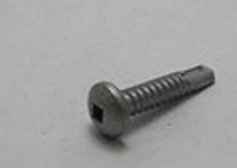 We carry a large inventory of Pan Head Square Drive (Robertson) Self Drilling Screws in 410 hardened stainless steel. Diameters from #6 to #14 and lengths up to 3″. They are also available in 18.8 stainless for soft drilling applications.